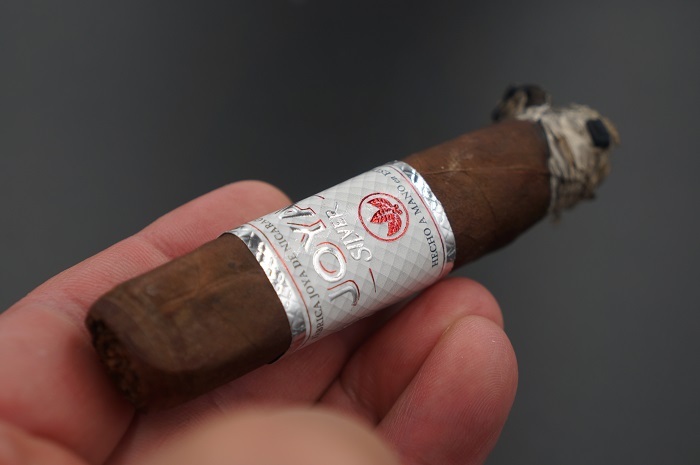 The box pressed robusto has a veiny medium brown wrapper. The seams are smooth but easily visible due to color variations and vein placement. The head is finished off with a triple cap that has edges lifting in various places. The band is the traditional JOYA band but in a silver white and red color combination. The aroma from the wrapper is a mix of wood and cocoa while the foot brings some more wood along with a nice sweet pipe tobacco note. The pre-light draw brings light wood and floral notes. 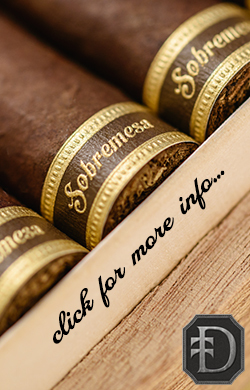 The pressed Robusto is firm in hand and sports a lovely wrapper that is dark brown in coloring with some reddish hue as well. The cap is applied well and the texture is very leather like. There are some bumpy parts to touch where larger veins are present in the wrapper, but for the most part the wrapper sports small sized veins throughout. The wrapper is giving off an aroma of rich spices, manure and hay, while the foot is giving off notes of chocolate, rich earth, raisins, spice, leather and strong tobacco. The cold draw is giving off tons of raisins and chocolate flavors, and it’s a solid cold draw. 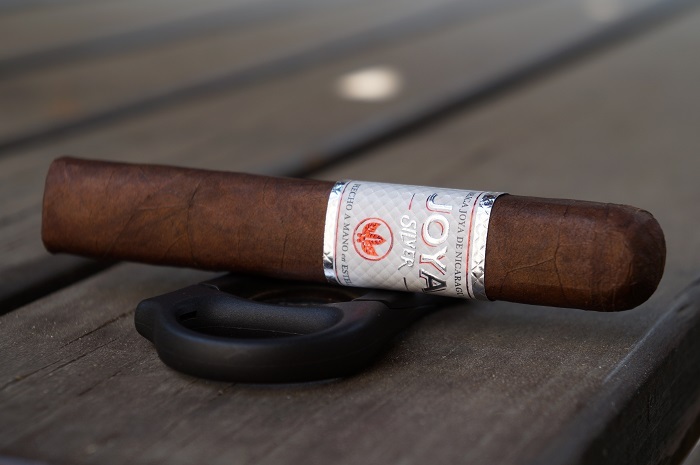 The Joya de Nicaragua JOYA Silver Robusto has a chocolate brown wrapper, with pressed veins throughout. It also features a soft box press. The band is slightly longer than average, with a metallic silver against white with a red tobacco leaf accent. 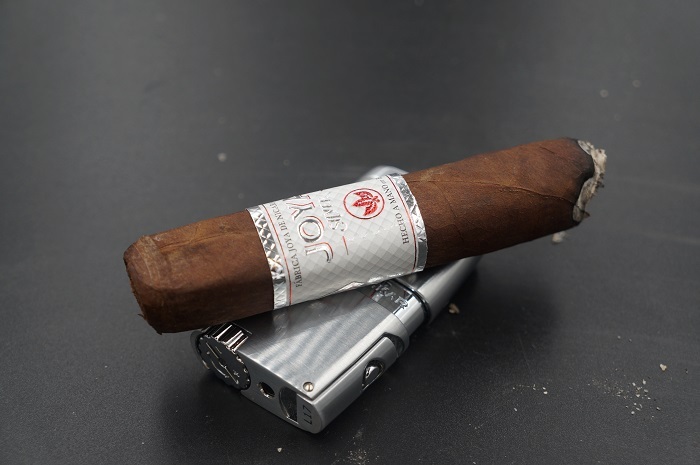 The aroma on the wrapper is medium-full leather and medium cedar. From the foot, I’m picking up sweet hay and barnyard. 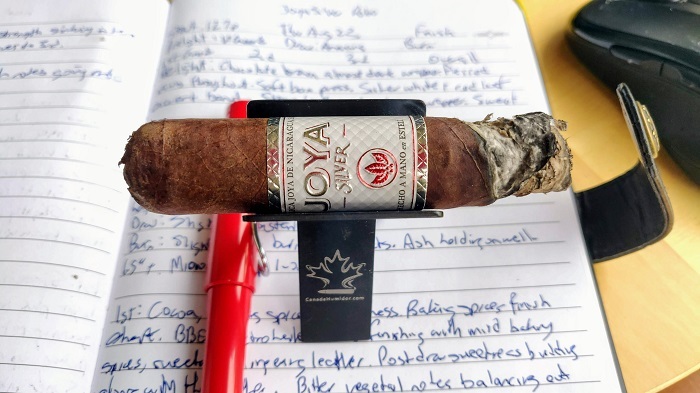 The Joya de Nicaragua JOYA Silver Robusto has a gorgeous and hearty red rustic hue on the Ecuadorian Oscuro wrapper. Construction and feel is great as veins are well pressed, seams tight, bunch and roll even and head finished off with a well applied triple cap. Nosing the wrapper tells dirt, nuts and subtle white pepper. Nosing the foot gives pungent white pepper and cedar. Cold draw tells hay and toast. 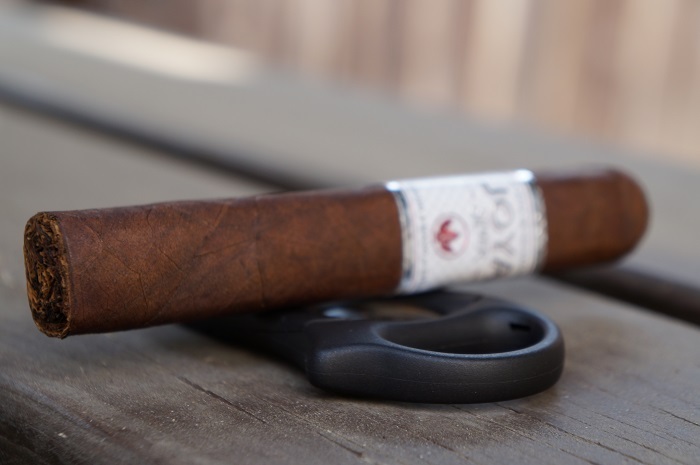 The cigar begins with charred wood, some black pepper and a very faint underlying sweetness. At a quarter inch in, the char lessens and the wood becomes more identifiable as cedar while the sweetness is now coming from a faint pipe tobacco note like what I got from the foot aroma pre-light. At an inch in, a slight cream joins the mix to smooth out the profile of charred cedar and black pepper. The sweetness is now gone from the profile. The retrohale provides a general creamy wood note. As the third comes to a close, the profile is slightly charred wood with a light cream while the black pepper has faded away. The strength in this third was right at medium. The cigar opens up with a plethora of spices. There is some richness and sweetness to it, but a lot of red pepper notes up front. I am picking up some oak and barnyard qualities of earth and wood, and there is a faint bit of dry chocolate cake and meatiness on the finish. 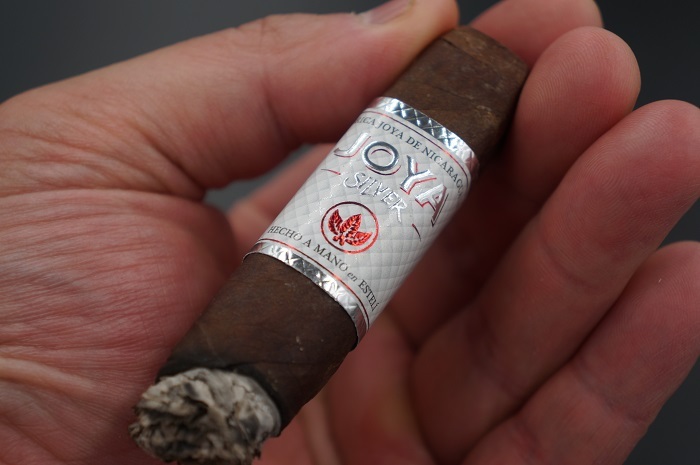 It is full in strength and body, flavors as well, and it is rocking that Joya quality. The burn line is off in the first third, requiring some touch-ups, but so far fairly enjoyable. The initial flavors are cocoa, baking spices and sweetness, with the baking spices having a very short finish. On the retrohale, there’s some barbeque adding to the complexity. The draw finishes with mild baking spices, sweetness and a medium intensity leather that lingers between draws. As the first third settles in, there’s some bitter vegetal notes that serve to balance out the sweetness and cocoa. The sweetness on the retrohale continues to evolve into a creamy sweetness that merges with the cocoa. 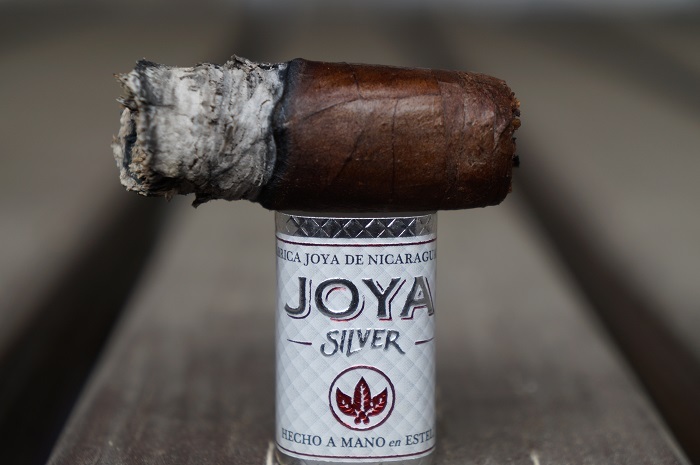 As the JOYA Silver transitions to the middle third, the bitter vegetal note falls to a light strength level. Sweet and spicy is how I would characterize the first thirds experience. Plenty of dried red pepper spice and an almost candied like sweetness. Further, cedar and baking spices round out the profile. Retrohaling gives greater dry red pepper spice and cedar. The finish contains the spice on the back end as well as leather and semi-gritty earthiness. Strength is somewhere in between medium to medium-full, while body is medium. As the second third begins, the cedar transitions to a general wood note to go along with the char and light creaminess. At a quarter inch in, the cream begins to increase, creating a fuller flavored profile. At an inch in, the cream is now slightly ahead of the charred wood. The retrohale is a mirror image of the flavors in the mouth draws. As the third comes to a close, the char picks up on the wood to bring it even with the cream. The strength in this third remained at medium. 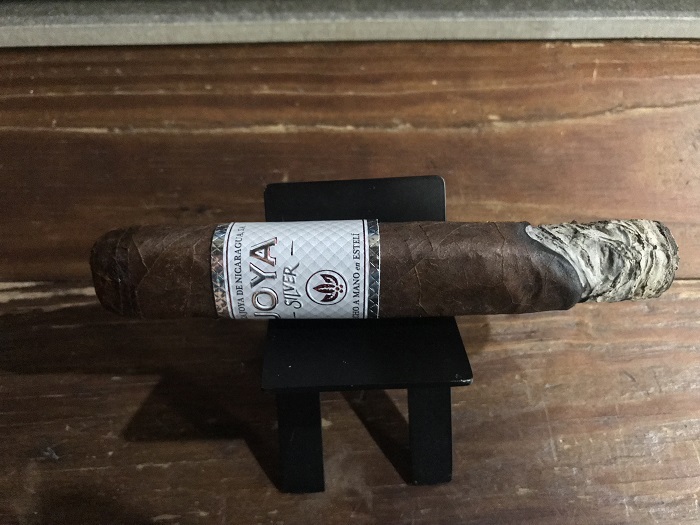 As I enter into the second third of the cigar, I find the spice profile to be prominent still, major focus on the pepper notes, and it is accompanied by some herbal and metallic qualities that are playing alongside this jerky quality. The earthy and chocolate notes have faded, as have the woody notes from the first third. The cigar has required a lot of touch-ups, but simple fixes to keep the burn from getting out of whack. As before, the cigar is full in strength, body and flavors. As the second third starts, some of the vegetal returns at a light plus, and the bitterness is absent. 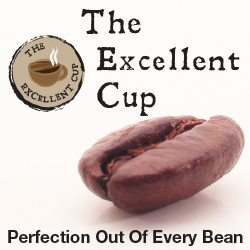 The regular profile is the same as the first third with cocoa, mild baking spices, a sweet creaminess and post draw leather. Once the second third has established itself, the cocoa intensifies to a medium, almost medium plus level for the remainder of the third. The Second third’s strength moves up to a consistent medium-full (body still medium). In terms of flavors, it’s still that great mix of spice and sweetness with dry red peppers, candied like sweetness, cedar and baking spices. The profile also becomes noticeably creamier with perhaps a buttered bread note. As the final third begins, the charred wood and cream remain even and the profile becomes a bit fuller. Along with the similar profile, the retrohale carries a bit of meatiness to it. At an inch in, the cigar has warmed up to bring some toast along with the char to the wood. The cream is still an equal player. The retrohale has lost the meatiness and is primarily charred wood with a little bit of cream. This is how the cigar finishes out. The strength in this third bumped up to slightly above medium. When I get into the final third, I find a flavor profile that is to my liking. The chocolate and raisin notes are making an appearance and they are paired with this sweet baking spice and red pepper. There is little meatiness present, same for metallic and herbal qualities and it is rich and spicy. 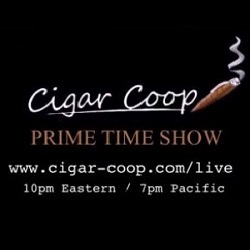 I am picking up the Mexican binder now, more so than ever, and it is balancing the Ecuadorian wrapper and completed with the quality Nicaraguan fillers. It is still full in terms of body and strength, just more complex and possessing depth. 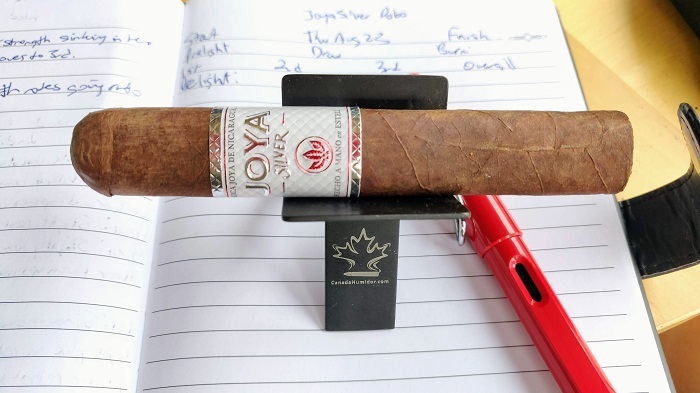 Some medium cedar flavors take the JOYA Silver into the final third. It remains throughout, serving to balance the medium strength cocoa. The last third continues to be medium-full strength and medium bodied delivery of dry red peppers, candied sweetness, cedar, buttered bread and baking spices. The burn was a bit wavy but always kept up with itself. The ash held on in inch and a half increments. 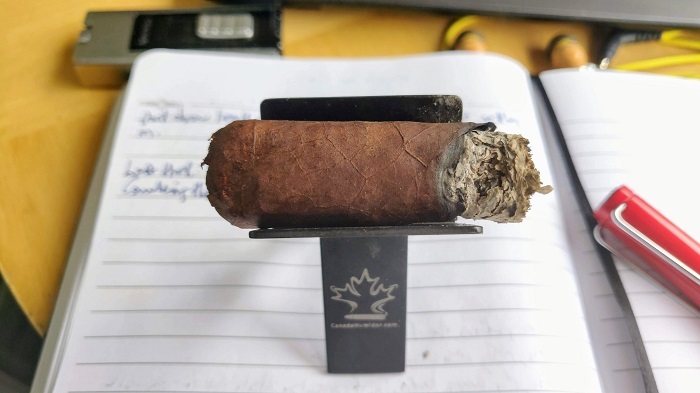 For the first two thirds, this cigar smoked poorly. I hate having to touch-up my cigar and I am a strong believer that construction should be spot on. It did improve in the final third, the final third was the best part of the cigar in many ways, but at that point it is too late. There was a slightly wavy burn at times, but I left the cigar alone and it self corrected each time. The ash held on well in 1.5″+ increments. Burn performance was overall good having a relatively cool and even burn and somewhat of a sturdy ash. The flavor profile was centered around charred wood and cream and didn’t really waver much from that core. Construction was great and allowed me to just focus on the flavors. 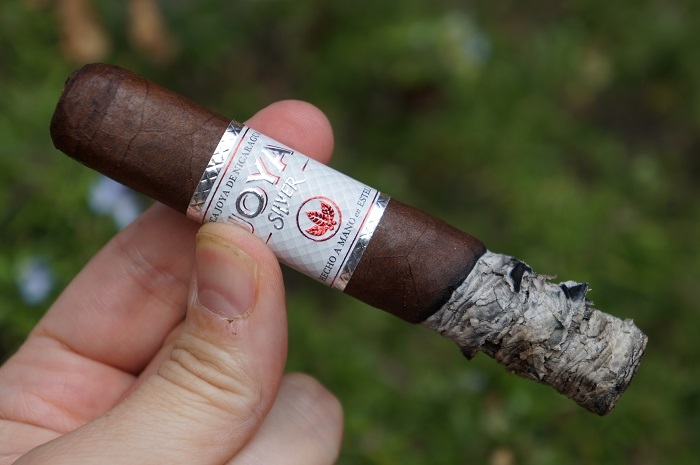 This cigar smoked quite slow for its size and the strength level stayed right around medium. In combination with the slow smoking time, the price factors in to a very valuable smoking experience. 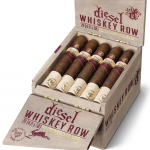 For those that try this and really like it, it would be an easy cigar to go deep on and possibly be a daily smoke. 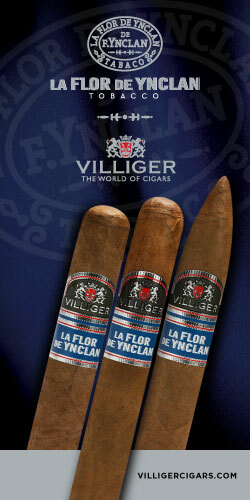 I’m very interested to see if the other vitolas smoke similar and to find out which one is the best of the bunch. I could easily see myself smoking more of these. 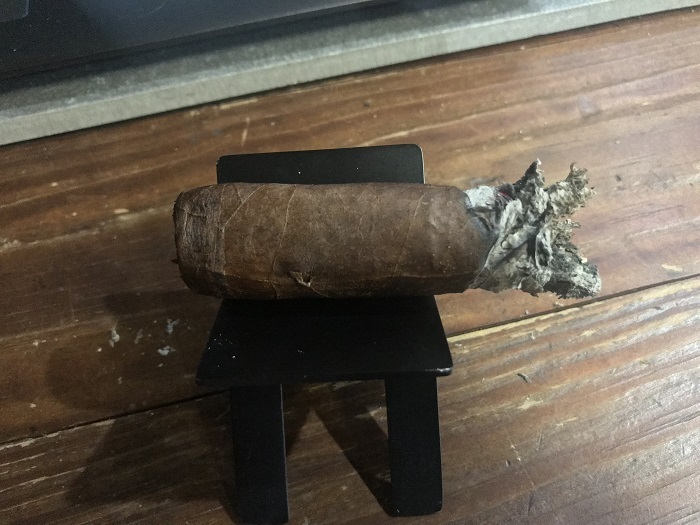 From start to finish the cigar had a great draw and no complaints on that end. 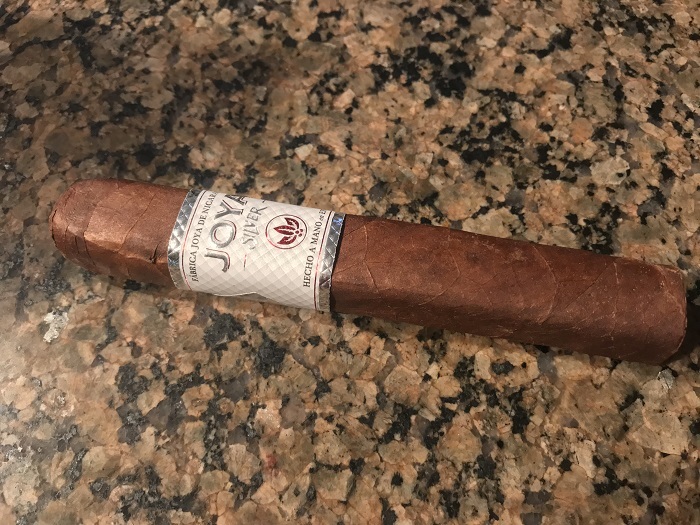 Overall, I was not blown away by the cigar. I think if it smoked like it did in the final third for the whole cigar I would have a higher opinion of it overall. I felt that the wrapper really dominated and I was hoping to get more from the binder and filler. Perhaps it will smoke better in a larger format. For me, the wrapper was too much and not to my liking. I thought it lacked some balance, complexity and depth that I was really hoping for. 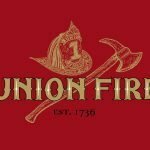 I am not against a full body and full strength cigar, but I want something else with that. 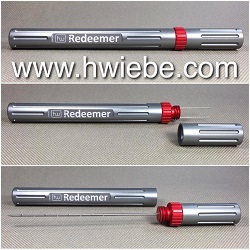 Cutting with my v-cutter, the draw is slightly resistant, which puts it right in the ideal draw zone. 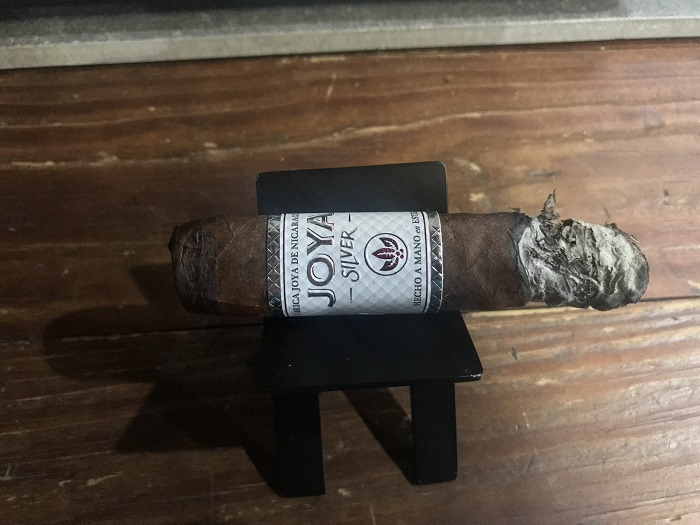 The Joya de Nicaragua JOYA Silver Robusto finds a perfect slot between the Joya Red and the Joya Black. The strength of the cigar never goes above medium, while the flavor complexity flirts with medium-full throughout the smoking experience. 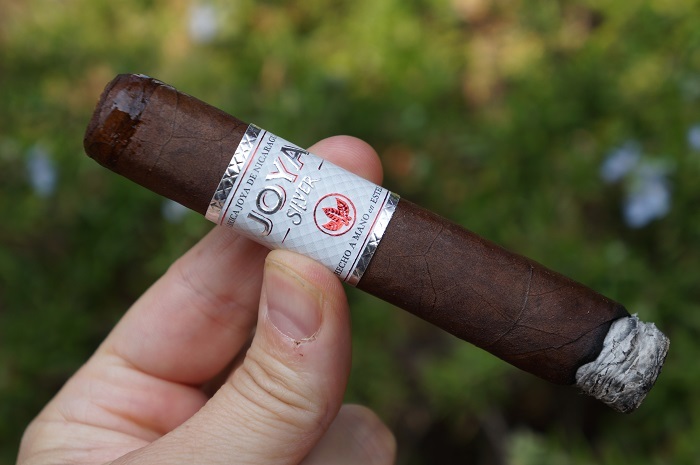 This is another hit from Joya de Nicaragua, and I expect it will see substantial success in the market. Draw was perfect, striking the perfect balance of air flow and resistance. 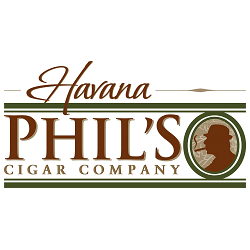 A great mixture of sweet and spicy all wrapped up in an attractive value of a $7 cigar. 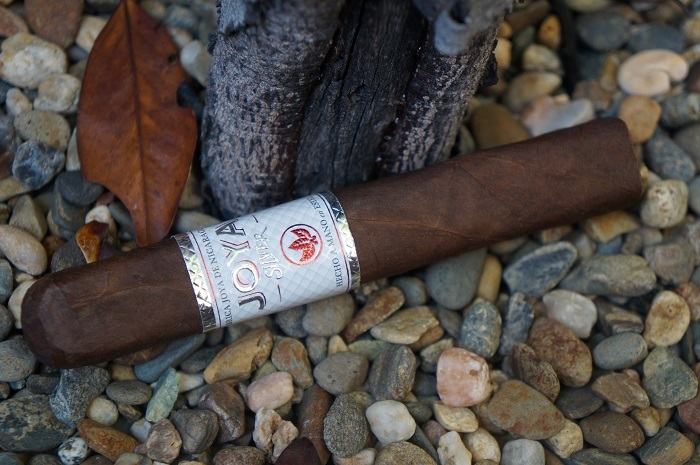 Within the last two years or so of Joya’s new releases, they have proven that they just don’t miss. All have been tasty with attractive pricing. 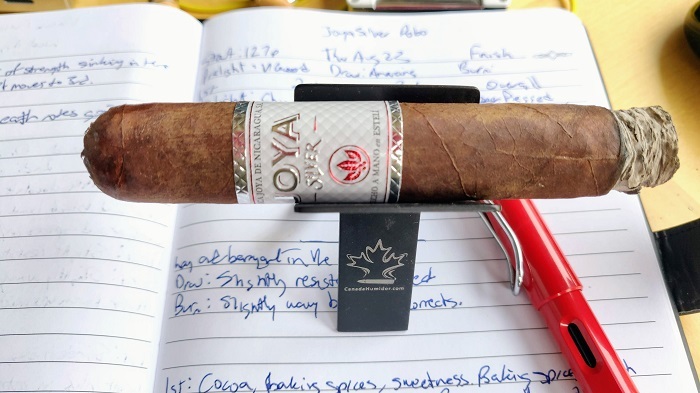 The Silver does tip the scale on strength being overall medium-full in nature (but not full blown like the Antano Dark Corojo). However, it’s strength that doesn’t sneak up on you at the end, but instead eases into the profile in a consistent manner. 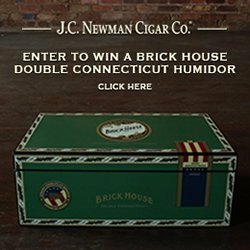 This cigar is a winner.